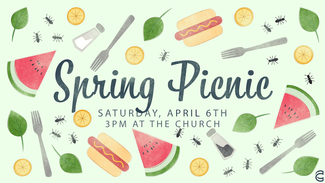 Please join us for a time of food, fun, and fellowship. We will have hamburgers, hot dogs, and all the trimmings. There will be a waterslide for the kids, volleyball and kickball for the adults and teens, along with more games for all ages. We will be at Sarah's state meet. Enjoy! Unfortunately, we will not be there. Sarah's State Meet is this weekend. Enjoy! I will have family in town and I do not know what they are planning at this time.